Kim Gordon, of course, created a legacy of musical innovation. Thriving on the playgrounds of noise music for more than three decades, her band Sonic Youth stoically pursued their own particularly dirty blend of noise-punk experimental rock music, while still miraculously achieving mainstream success without ever ceding ground to mediocrity. If anything, Sonic Youth became a household name for integrity and that specific kind of cool in a genre where cool is firmly attached to youth – which certainly had a lot to do with the detached charisma of Kim Gordon. While Sonic Youth’s influence on past and current generations of experimental and punk music is undisputed, Kim Gordon’s role as a female figurehead in music and also in the visual arts might be a more complex one, based on the highly personal pursuit of her highly diverse interests without, unlike so many of today’s pop stars, any discernible strategy or intentional provocation. Instead, it seems to be Gordon’s unfailing belief in staying true to oneself and the power of subcultures that would establish her as such an iconic and influential role model. As, for personal reasons, the future of Sonic Youth remains uncertain, Kim Gordon shows no signs of standing still, returning to her beginnings as a fine artist and pursuing her ongoing fascination with noise, in sound and on canvas. With mono.kultur, Kim Gordon talked about the clichés of women in rock, the myths of New York and why fine art was her first love. 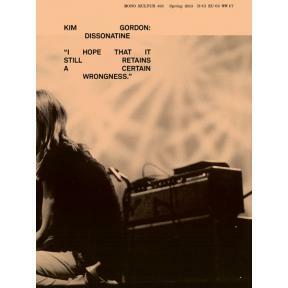 Treading the fine line between rock and roll, and true to Gordon’s ‘anything goes’ DIY philosophy, the issue is somewhat of a treasure chest filled with new and old artwork by Kim Gordon, coming in a set of loose sheets and cards in varying sizes and printed on no less than five different paper stocks, all held together by the most basic commodity of all: the good old rubber band.